ATLANTA — There’s a lot that is not for sale at For Keeps, a little bookstore with brick walls on Auburn Avenue, which for decades had been the center of commerce, culture and spirit for this city people call Black Mecca. That copy of Jet magazine from 1964, the one with Alan Alda and Diana Sands on the cover, illustrating an article about interracial romances in the theater? Not for sale. The book of Swahili names for your baby, or that copy of The African Communist? Nope. But you are welcome to spend all day here reading, if you like. That’s the point. “The reason I’m not selling them is because I want people to have as many interactions with them as they can,” said Rosa Duffy, 28, a visual artist with deep Atlanta roots who opened the bookstore in November. There is plenty to buy, of course. 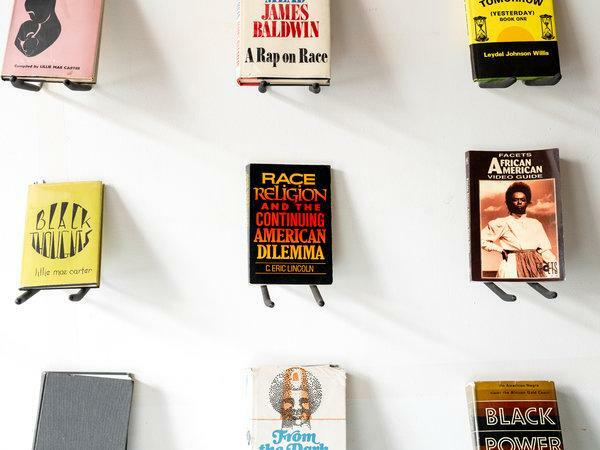 Her shelves hold used black-lit classics from authors like Toni Morrison, Maya Angelou and Ralph Ellison. If they’re well worn, that’s all the better. Duffy has always wanted to find a way to work around books. Much of her art includes snippets of text or images from books and journals. It’s a style she developed when she was a teenager and would sneak into her father’s library to find images among his vast collection of books and rare journals like Soulbook, a periodical from the late 1960s and 70s which its Berkeley, Calif., founders called the revolutionary journal of the black world. Her father, Eugene Duffy, has worked for three mayors including Atlanta’s first black mayor, Maynard Jackson, and Andrew Young, a close confidant of Martin Luther King Jr. who went on to become the United States ambassador to the United Nations and remains a close family friend. Her dad’s collection, along with her sister’s, was inspiration for the bookstore. “My grandma has a great collection, too,” she said. After high school, Duffy headed to New York to study at the New School, collecting books along the way. She found some real treasures for cheap, like a hard cover of Pat Parker’s “Jonestown and Other Madness” that she dug out of the Strand bookstore’s dollar bin. She also spent time wandering through little shops in the East Village, where books on black history were often limited to one small shelf. “I always thought that if I ever had the chance I wanted to expand that little shelf somehow,” she said. The chance came after she moved back to Atlanta in 2016 and found herself in a lull between projects. Rent on Auburn Avenue was affordable. Interest in black identity was on the rise. And she had the time and means to make it work. “It was like all these things were coming together,” she said. The space used to be a shoe store. In the center of the room, she set up a large round table covered with books, political journals and old magazines available for reading only. Many books for sale are displayed on the walls so that the covers are visible, as if they were works of art. Her own prints hang next to them. Music from Charles Mingus or Atlanta native Waka Flocka Flame is often playing in the background. The location holds a lot of meaning. It’s not far from the church she grew up going to or from Spelman and Morehouse, two historically black colleges where her parents went to school. It’s a neighborhood on the verge of gentrification and she is determined to help it keep a strong black identity. The store drew a big crowd when it opened, in part because her sister, the lawyer and journalist Josie Duffy Rice, sent out a tweet about it that the filmmaker Ava DuVernay then retweeted. Duffy said she is constantly learning more about what to buy and what the community wants, often sifting through collections of books and other materials people bring in when a family member dies.